Due to the new reconstruction project between the Lincoln Memorial and the Kennedy Center, there is no longer driver access to the E-Street Expressway. All westbound traffic on Independence Ave must now go north at either 15th or 17th Streets. The U.S. Park Service says the work is part of a larger project that includes the reconstruction of Ohio Drive and the storm drain system. Some night closures are also expected. With tourists flooding town and flocking to that end of the Mall, expect traffic patterns to change between rush and non-rush hours – or find a different route for the time being. The project is expected to wrap up in October. The headline of this post seems somewhat misleading. The E Street Expressway itself isn’t closing – just the access from Independence Avenue via Ohio Drive, right? And it’s not so much the E Street Expressway as the Potomac Parkway it would seem. 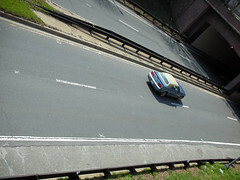 The Expressway between E St. and I-66/Rt. 50 hasn’t been affected thus far at least. So if I understand this right, only the ramp to get on eastbound E St Expressway is closed if you’re coming from the Lincoln Memorial. Is that right? How about the ramp coming from the Whitehurst/Rock Creek connecting to the E St Expressway Eastbound?